Based on the increasing popularity of machine mounted I/O utilizing readily available IP67 components, it’s more important than ever to utilize every I/O point. I/O density has increased over the years and the types of I/O have become more diversified, yet in many systems pin 2 is left unused by the end user. 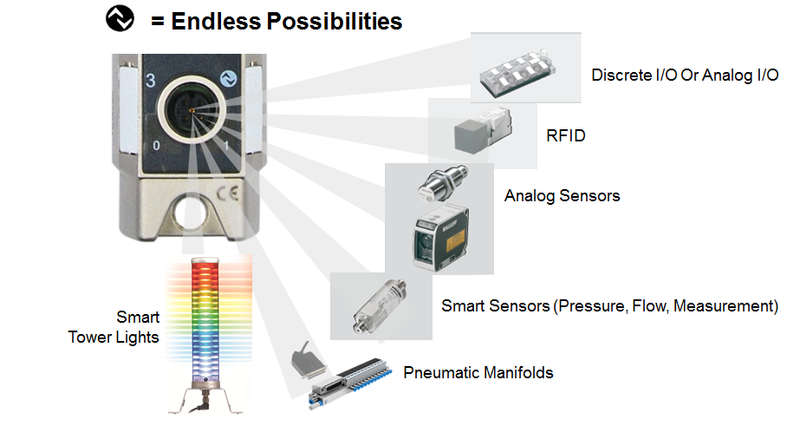 Sensors tend to come in twos, for example, a pneumatic cylinder may require a sensor for the extended position and one for the retracted position. Running each individual sensor back to the interface block utilizes pins 1,3 and 4 (for power, ground and signal) but wastes pin 2 on each port. Rather than using a separate port on the I/O block for each sensor, a splitter can collect the outputs of two sensors and deliver the input to a single port. With a splitter, one sensor output goes to pin 4, the other goes to pin 2. Fig. 2a Typical splitter wiring where I is the trunk of the splitter and heads II and III are the extensions going to the sensors. 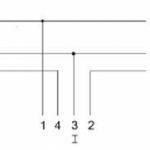 By putting two signals into one and utilizing both pins 2 and 4, the overall I/O point cost decreases. A T-splitter is a good way to utilize pin 2. However, the “T” covers the I/O module port eliminating the benefit of the high-value diagnostic LEDs on the block. Also, individual cables must run all the way from the block to the sensors at the installation point, creating clutter and cable bulk. In addition, when Ts are used on a vertically mounted block, the extra cable bulk can weigh down the T-splitter and threaten its integrity. The use of a V-type configuration allows better visibility of the diagnostic LEDs and eliminates the need to purchase a separate part. However, individual cables must still be run from the block to the sensors, creating clutter and cable bulk. In the Y-type splitter configuration, all aspects of usability are improved. One cable runs from the I/O block to the installation point. The split of pins 2 and 4 is done as close to the sensors as possible. This significantly cleans up cable clutter, provides a completely unrestricted view of the diagnostic LEDs and allows for easy installation of multiple connectors to the I/O block. We have been talking about IO-Link for a long time. 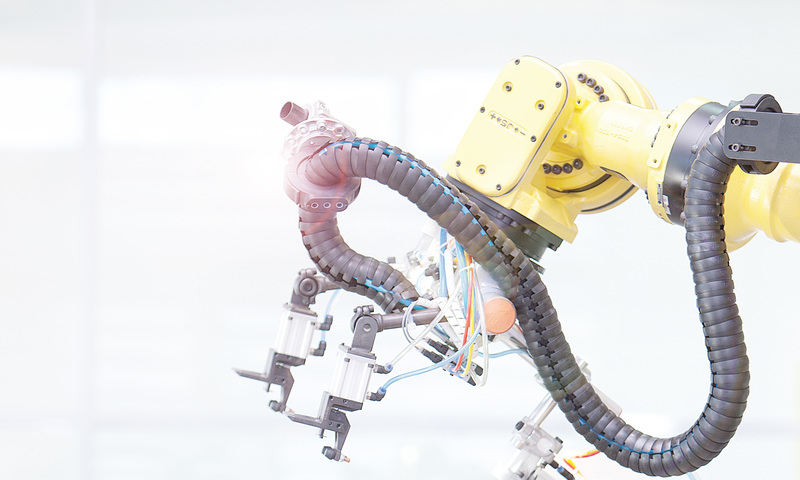 The benefits to manufacturers like “hot-swapping” a smart device. One of the benefits for machine builder is reducing commissioning time. So it was not surprising to me to find IO-Link on the exhibit floor at IMTS 2016, but it was surprising how much IO-Link was used on equipment and demonstrations. On a cool demo of robotic load and unload of two machining centers from the team at Makino Machine IO-Link was used for I/O applications driving solenoids and collecting sensor inputs. What is neat about I/O hubs regardless of the brand is the ability to collect many simple discrete sensor inputs and drive outputs over one IO-Link channel. It can save tim dramatically over traditional hardwired applications. At Beckhoff they were showing their IO-Link master options for a slice in the PLC. 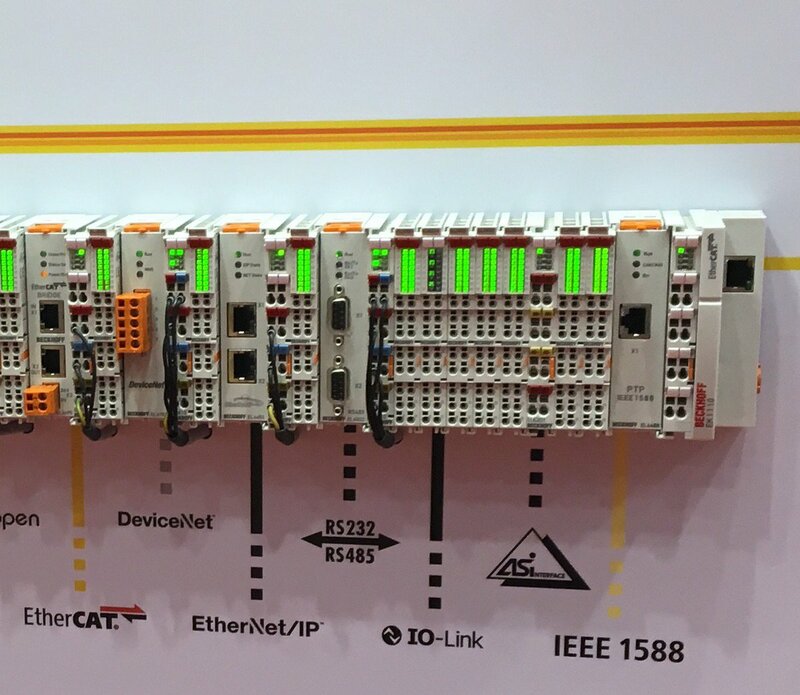 Molex displayed their Profinet IO-Link master and slave devices like analog converter and digital I/O hubs. What I liked about their demo is they showed how open and easy the IO-Link technology is to integrate other company’s devices like the Balluff SmartLight. 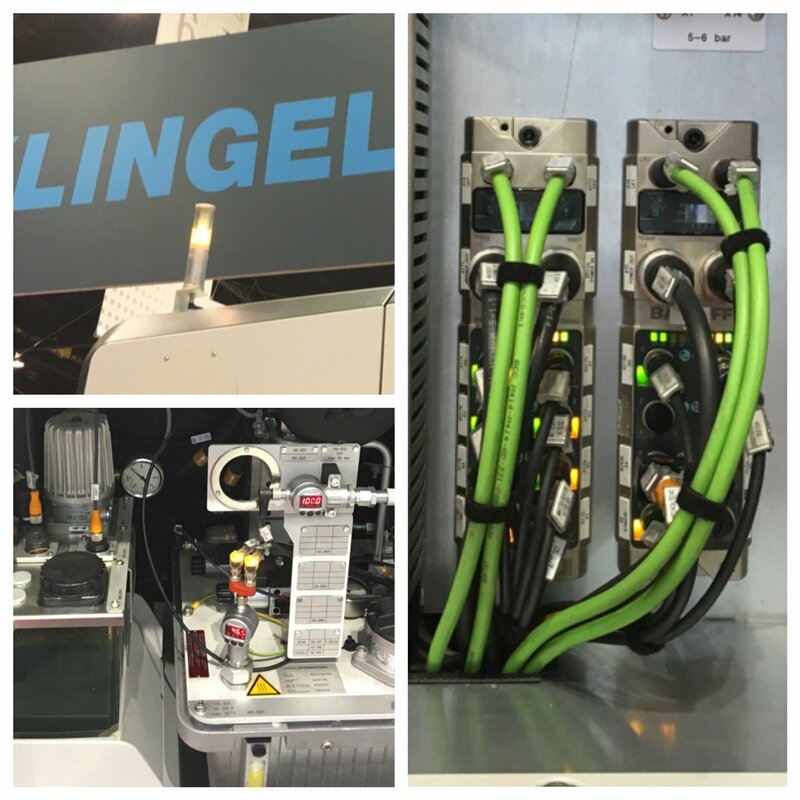 In the Klingelnberg booth on one of their flagship machines IO-Link masters and SmartLight were installed on the machine. IO-Link inductive positioning Smart Sensors from Balluff were used for measurement of the chucking position. And inter-operability was also shown with multiple manufacturer’s process sensors with IO-Link installed tied back to a Profinet master. Since IO-Link is an open standard with over 90 automation vendors, it was nice to see the inter-operability in action. 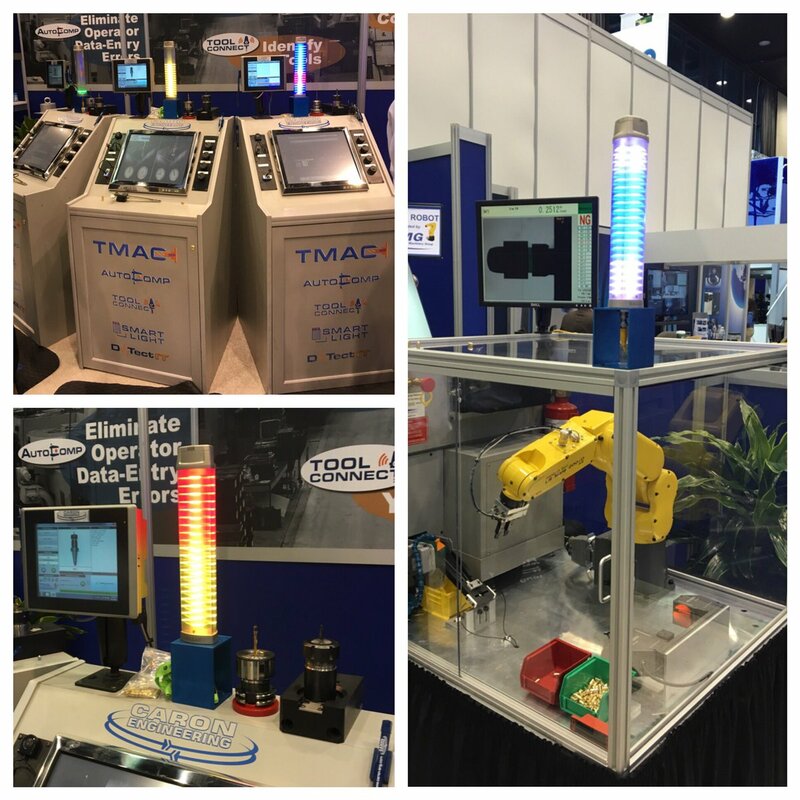 The SmartLight was shown all over the IMTS show due to Caron Engineering’s easy integration into a PC without an industrial network. Too many booths to name had the SmartLight integrated with the Caron IO-Link Master solution. The fact that IO-Link can be used with multiple master interfaces and options, really makes it an easy to select and universal choice for a variety of applications. I look forward to seeing what unfolds in the two years before the next IMTS show. I anticipate there will be a dramatic and continued adoption of IO-Link as it enables and scales Industry 4.0 and IIoT applications. To see more or join the conversation check out #IMTS2016 on Twitter. Is IO-Link only for Simplifying Sensor Integration? On several occasions, I was asked what other applications IO-Link is suitable for? Is it only for sensor integration? Well the answer is no! There are several uses for IO-Link and we are just beginning to scratch the surface for what IO-Link can do. In this blog post I will cover at least 7 common uses for IO-Link including sensor integration. IO-Link in essence provides tremendous flexibility. 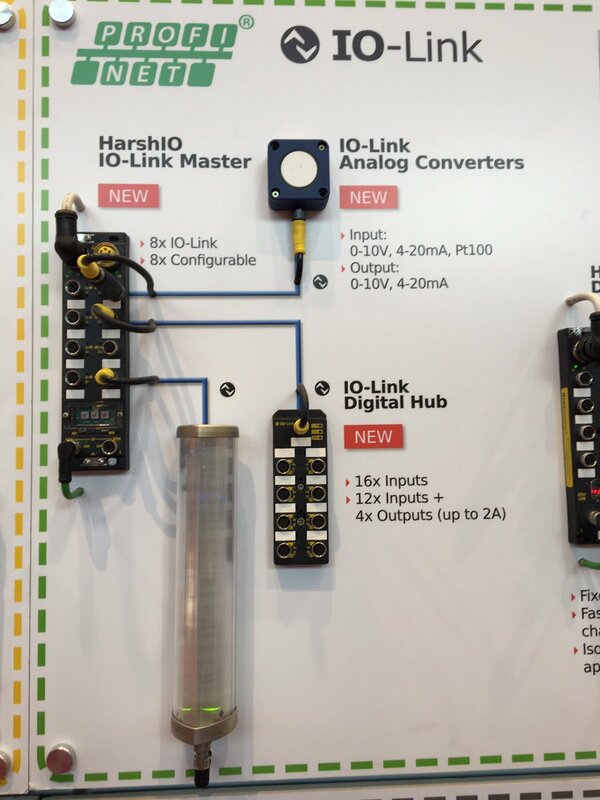 Each available IO-Link port offers the possibility to connect devices from hundreds of manufacturers to build a resilient distributed modular controls architecture — that is essentially independent of the fieldbus or network. IO-Link is the first standardized sensor/actuator communication protocol as defined in IEC61131-9. Multitudes of IO-Link sensors from 100+ manufacturers can be connected using the simple 3-wire M12 prox cables. No shielded cables are required. Additionally, using IO-Link provides a parameterization feature and anti-tampering abilities- on the same 3 wires. The sensor can be configured remotely through a PLC or the controller and all the configuration settings can be stored for re-application when the sensor is replaced. This way, on your dreaded night shift changing complex sensor is just plug-n-play. Recipe changes on the line are a breeze too. For example, if you have an IO-Link color sensor configured to detect a green color and for the next batch you want to start detecting red color- with IO-Link it is simply a matter of sending a parameter for the color sensor – instead of sending a maintenance person to change the settings on the sensor itself — saving valuable time on the line. In one of my previous blogs, “Simplify your existing analog sensor connection”, I detailed how connecting an analog sensor with single or multi-channel analog-to-IO-Link (A/D) converters can eliminate expensive shielded cables and expensive analog cards in the controller rack and avoids all the hassle that comes with the analog sensors. IO-Link makes applications with RFID particularly intriguing because it takes all the complexity of the RFID systems out for simple applications such as access control, error-proofing, number plate tracking and so on. In an open port on IO-Link master device you can add read/write or read only RFID heads and start programming. A couple of things to note here is this IO-Link based RFID is geared for small data communication where the data is about 100-200 bytes. Of-course if you are getting into high volume data applications a dedicated RFID is preferred. The applications mentioned above are not data intensive and IO-Link RFID is a perfect solution for it. Typically valve banks from major manufacturers come with a D-sub connection with 25 pins. These 25 wires are now required to be routed back to the controls cabinet, cut, stripped, labeled, crimped and then terminated. The other expensive option is to use a network node on the valve bank itself, which requires routing expensive network cable and power cable to the valve bank. Not to mention the added cost for the network node on the valve bank. Several manufacturers now offer IO-Link on the valve manifold itself simplifying connection to 4-wires and utilizing inexpensive M12 prox cables. If you still have the old D-sub connector, an IO-Link to 25-pin D-sub connectors may be a better solution to simplify the valve bank installation. This way, you can easily retrofit your valve bank to get the enhanced diagnostics with IO-Link without much cost. 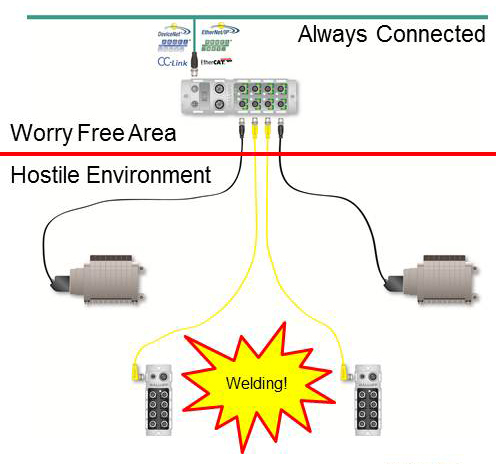 Using IO-Link valve connectors not only saves time on integration by avoiding the labor associated with wire routing, but it also offers a cost effective solution compared to a network node on the valve manifold. 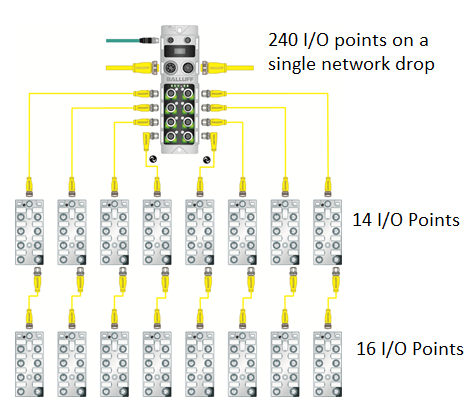 Now you can get multiple valve manifolds on the single network node (used by the IO-Link master) rather than providing a single node for each valve manifold in use. Who would have thought IO-Link can add intelligence to a stack light or status indicator? Well, we did. Balluff introduced an IO-Link based fully programmable LED tower light system to disrupt the status indicator market. The LED tower light, or SmartLight, uses a 3-wire M12 prox cable and offers different modes of operations such as standard stack light mode with up to 5 segments of various color lights to show the status of the system, or as a run-light mode to display particular information about your process such as system is running but soon needs a mechanical or electrical maintenance and this is done by simply changing colors of a running segment or the background segment. Another mode of operation could be a level mode where you can show the progress of process or show the fork-lift operators that the station is running low on parts. Since the Smartlight uses LEDs to show the information, the colors, and the intensity of the light can be programmed. If that is not enough you can also add a buzzer that offers programmable chopped, beep or continuous sound. The Smartlight takes all of the complexity of the stack light and adds more features and functions to upgrade your plant floor. USE-CASE #7: Build flexible high density I/O architectures. How many I/O points are you hosting today on a single network drop? The typical answer is 16 I/O points. What happens when you need one additional I/O point or the end-user demands 20% additional I/O points on the machine? Until now, you were adding more network or fieldbus nodes and maintaining them. With I/O hubs powered by IO-link on that same M12 4-wire cable, now each network node can host up to 480 I/O points if you use 16 port IO-Link masters. Typically most of our customers use 8-port IO-Link masters and they have the capacity to build up to 240 configurable I/O on a single network drop. Each port on the I/O hub hosts two channels of I/O points with each channel configurable as input or output, as normally open or normally closed. Additionally, you can get diagnostics down to each port about over-current or short-circuit. And the good thing is, each I/O hub can be about 20m away. In a nutshell, IO-Link can be used for more than just simplifying sensor integration and can help significantly reduce your costs for building flexible resilient controls architectures. Still don’t believe it? Contact us and we can work through your particular architecture to see if IO-Link offers a viable option for you on your next project. It’s the worst when a network goes down on a piece of equipment. No diagnostics are available to help troubleshooting and all communication is dead. The only way to find the problem is to physically and visually inspect the hardware on the network until you can find the culprit. Many manufacturers have told me over the past few months about experiences they’ve had with down networks and how a simple cable or connector is to blame for hours of downtime. By utilizing IO-Link, which has been discussed in these earlier blogs, and by changing the physical routing of the network hardware, you can now eliminate the loss of communication. The expandable architecture of IO-Link allows the master to communicate over the industrial network and be mounted in a “worry-free” zone away from any hostile environments. Then the IO-Link device is mounted in the hostile environment like a weld cell and it is exposed to the slag debris and damage. If the IO-Link device fails due to damage, the network remains connected and the IO-Link master reports detailed diagnostics on the failure and which device to replace. This can dramatically reduce the amount of time production is down. In addition the IO-Link device utilizes a simple sensor cable for communication and can use protection devices designed for these types of cables. The best part of this is that the network keeps communicating the whole time. If you are interested in learning more about the benefits that IO-Link can provide to manufacturers visit www.balluff.us. If you are a manager at any level of a manufacturing facility, I hope you are aware of the dangers of arc flash. For those who are not aware, “an arc flash, also called arc blast or arc fault is a type of electrical explosion that results from a low-impedance connection to ground or another voltage phase in an electrical system.” Typically this does not occur in 120V situations, but can occur in 480V+ installations if proper precautions are not taken. Employees can be severely injured or even killed when an accident occurs while working with these kinds of electrical systems. There are many standards like OSHA, IEEE and NFPA that regulate these types of situations to provide a safe working environment for the employee. In addition to those standards, I would propose two simple changes to controls architecture and design to help limit the exposure to working inside an electrical cabinet. This post will show how to couple stamping die segments without a hard wire connection, AND prevent the potential gorilla-like effects of forklifts during die change! Have you ever experienced or heard about a forklift removing a stamping die with the giant Mil-Spec connector still attached (OOPS!!!!)? It certainly isn’t a pretty sight. Below is a typical Mil-spec connector, they aren’t cheap or easy to re-wire. Or, have you ever tried to figure out a way to add sensors in very complex progressive die segments that will facilitate rapid die change? If so, I have an answer for you with a non-contact connector system. Take a peek at the picture below. I’ve recently heard this comparison used a number of times and the parallels are quite interesting. USB was designed to help standardize a dizzying array of connectors and configurations of supplementary devices that developed during the age of the Compaq vs IBM. It always took days to configure and establish communication between devices and then finally you could never get all the functionality that the device promised because of your PC’s specific configuration. USB revolutionized the personal computer by allowing for a standard interface for simple devices from hard-drives to keyboard lights, and best of all by offering a device drivers the functionality promised could be delivered. If the device broke, you bought a new one, plugged it in and it worked. Distributed Modular I/O Demo on Demand! Everyone likes things on demand right? Movies, TV shows, chocolate, you name it. My good friend, John Harmon, has prepared a YouTube video so that you have at your fingertips an on-demand presentation on Distributed Modular I/O. It is a great overview of the available functionality of Distributed Modular I/O and what kinds of control products that are available utilizing this technology. I realize the video is seven and a half minutes, which is pretty long for a web video, but I think he does an excellent job of keeping your attention and demonstrating the value of this technology. Grab a soda and your favorite chocolate bar, put your phone on silent, and hit play on this excellent presentation. When assembling these at a machine builder the routing of cables with piping is more cumbersome with cables hanging off the valves, larger cable tray installations and large amounts of piping all running to the same spot. For machine builders, with all of the valves centralized in one place, the pneumatic lines have to be longer. This causes many issues such as slower responsiveness due to air volume, air inertia, and lower air quality. When trying to perform maintenance at an end-user, it becomes a nightmare to troubleshoot with a cluster of cables and pipes. The zip-tied and clean runs installed by the machine builder are cut, tangled and re-routed as the machine ages and becomes more difficult to troubleshoot. Also at end users, if the manifold needs to be expanded, updated, retrofitted with new valves or I/O, there are big hurdles to jump when doing this: re-piping the valve due to mounting position shifting or even having to edit and repair code in the PLC to adapt to new bitmaps generated by the new valve manifold configuration. When closing the loop with magnetic field sensors mounted on the cylinders, typically reed switches are used which are prone to failure. 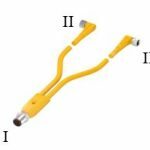 In addition, these switches typically have two sensors & cables per actuator to give extend or retract position, these cables cause larger cable trays and long cable runs back to the centralized manifold and I/O.